Last week two papers were published about human and other chimeras, one in Cell on ‘Interspecies chimerism with mammalian pluripotent stem cells’ and one in Nature entitled ‘Interspecies organogenesis generates autologous functional islets’. The first one caused a bit of a stir in the newspapers. About 70 newspaper articles covered this potential scientific breakthrough in All English Language News (between 26 and 30 January, 2017). Many used the phrase ‘human-pig hybrid’. A small number evoked visions of ‘monsters’ (12) and, of course, Frankenstein – but the numbers were surprisingly small (2). Headlines talked about half-human, half-pig embryos echoing the earliest headlines on this issue which appeared in the 1990s, such as “Frankenstein half-human, half animal hybrids” (Daily Mail, January 12, 1993). The hope is that such hybrids might provide us with transplantable organs in the distant future; the fear it that they break down almost sacred boundaries between animals and humans. More or less at the same time as these natural science papers were discussed in the press, Amy Hinterberger published an interesting social science paper on chimera regulation. The paper highlights how difficult regulation is in a context where clear boundaries unravel between humans and animals. The paper also mentions that thinking about human-animal hybrids and chimeras has a long history (p. 5). In this post I’ll try to explore that historical background a bit, as it informs current debates, perceptions and misconceptions. Now, a decade later, discussions seem to be starting up again. Although I haven’t done any extensive research into the matter, some of the media hype and rhetoric used now seems to mirror that of a decade ago – but is more attenuated. Before we talk about hybrids again it might be good to get a better grip, not only on the science of hybrids and chimeras, but also on the history of these concepts, as that impacts on how we think and talk about them. The concept of hybridity is an ancient one. Deriving from the Latin hybrida, it was first used to describe the offspring of a tame sow and wild boar, and was also used to describe Roman soldiers of mixed descent (Horace, Satires 1.7). Its usage in English dates as far back as 1601 when Philemon Holland, in his translation of Pliny the Elder, described how “[t]here is no creature ingenders so soon with wild of the kind, as doth swine; and verily such hogs in old time they called Hybrides, as a man would say, halfe wild” (Pliny II: 231) (see www.oed.com for a full list of spellings, etymology, quotations and dates). 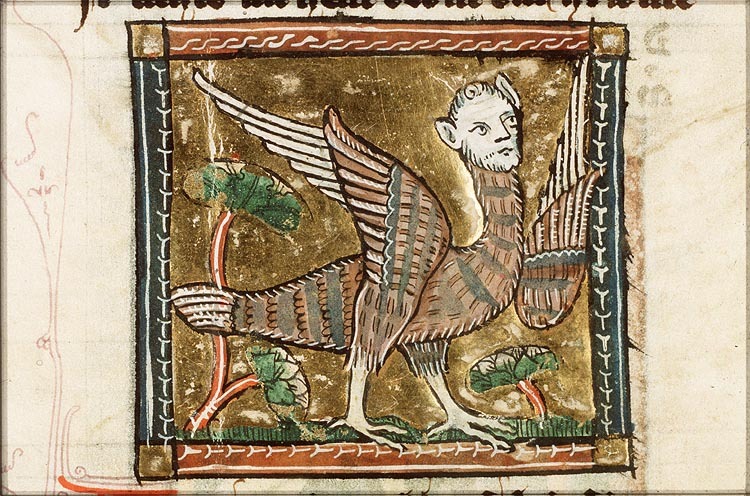 Artistic depictions of ‘hybrids’ are as old as humanity. “[C]omposite beings, from a world between humans and animals, are a common theme from the beginning of painting”. In the Middle Ages hybrids litter the margins of illuminated manuscripts; they “occupy a liminal space where the sacred meets the secular and profane”. Follow Damien Kempf on Twitter if you want to see some of them! Hybrids have always formed an integral part of myths, legend and speculation: Ovid describes the fluid interchange of divine, human and animal bodies in his Metamorphoses, and in Greek mythology fantastic creatures are typically depicted as hybrids or monsters, such as the Minotaur (man and bull), the centaur (man and horse) and the chimera (lion, goat and snake), to name but a few. The chimera, in turn, was a fire-breathing female monster with a lion’s head, a goat’s body, and a serpent’s tail. I’ll now jump forward in time! 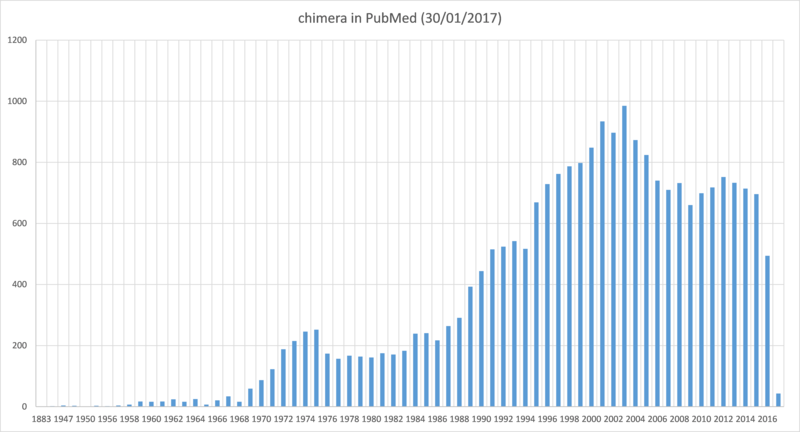 But before I do so I want to quote the lead author of the paper in Cell who makes a direct link between modern research and mythology: “for lead study author Jun Wu of the Salk Institute, we need only look to mythical chimeras—like the human-bird hybrids we know as angels—for a different perspective. ‘In ancient civilizations, chimeras were associated with God,’ he says, and our ancestors thought ‘the chimeric form can guard humans.’ In a sense, that’s what the team hopes human-animal hybrids will one day do.” (National Geographic) And, of course, this type of framing might guard against a Frankensteinian back-lash against science. By the late 18th century hybridity had come to be used to describe the offspring of two animals or plants of any different species, and it began to play a small role in scientific reflection. In the 18th and early 19th centuries, hybrids were still widely considered to be violations of nature, and most held the view that all species had been created by God and were “fixed within limits beyond which they cannot change”. Carl Linnaeus (the ‘father’ of plant taxonomy) advanced the idea that some species might begin as hybrids, and he updated the special creationist view he held in 1737 in his Philosophia botanica to account for natural hybrids. For many, Linnaeus’s theory was an assault on the idea of a natural order. Several botanists attempted to reconcile the existence of hybrids with their belief in the fixity of species by demonstrating an essential difference between hybrids and true species (Olby, 1966). The German botanists Joseph Gottlieb Kölreuter and Karl Friedrich von Gärtner devoted almost their entire lives to the subject of plant hybrids, and while they attempted to find a set of pre-Darwinian evolutionary proofs for their existence, they disputed the modified theory of special creation by qualifying their reproductive stability (Callender, 1988). In the 19th century the hybrid began to be discussed in scientific debates surrounding the nature of evolution. In a chapter entitled ‘hybridism’ in On the Origin of Species, Charles Darwin attempted to evaluate the evolutionary significance of hybrids, and to expose the essential difference between species and varieties as arbitrary (Darwin, 1859: Chapter IX). Darwin revolutionised evolutionary thought by refusing to take the line of botanists such as Gärtner, “whose strong wish it was to draw a distinct line between species and varieties”. In 1866 Gregor Mendel published a paper on plant hybridisation, “Experiments on Plant Hybrids”, that drew on several of Darwin’s ideas, but despite his commitment to a pre-Darwinian view of evolution Mendel never reached a point where he could make a definite conclusion about the role of hybrids in the origin of species (Clegg, 1997). The most recent phase in the development of the concept of hybridity happened in context of the emergence of genetic engineering. A key difference between hybrids today and their 18th– and 19th-century counterparts is that in modern discourse they are perceived as being ‘designed’, ‘made’ or ‘manufactured’ artificially rather than produced ‘organically’ through the ‘natural’ process of selective breeding or grafting. Scientists today can create hybrids, chimeras and transgenic creatures beyond the wildest dreams of Gärtner, Darwin, Mendel or Winzer. Moreover, where the experiments of the traditional botanists were laborious and time-consuming, now geneticists can theoretically create hybrids and chimeras almost instantaneously using CRISPR for example. These are the questions that would trouble the experts, lay people and the media throughout the years to come. Where do you draw the line between animal and human? At what point in the process of hybridisation should we become anxious that a moral boundary is being crossed and when it is time to turn back? To close this rather long post, I want go back to history, this time literature, to show that debates about the creation of hybrids and chimeras have been with us for a long time and will be with us even longer. As the authors of the article quoted at the beginning of this post have admitted themselves, actual human-animal hybrids that can be used for organ donation are still very very far away. When debating the merits (and hype) of creating human-animal hybrids or chimeras, people often refer to Mary Shelley’s Frankenstein (1818) or H. G. Wells’ The Island of Doctor Moreau (1896). Both evoke the spectre of ‘monsters’ (a Mirror headline in 2016 declared: “Frankenstein scientists developing part-human part-animal ‘chimera’ embryos which could treat diseases”; LifeNews.com heralded this January’s study as: “Scientists create human-pig hybrids for organ transplants that could develop into ‘monsters'”). The dibble in earth to set one slip of them…. This dialogue encapsulates positions on the issue of genetic engineering and hybrids/chimeras with which we are still grappling. On the one hand we have Polixenes who defends and celebrates the manipulation of nature; on the other we have Perdita who condemns hybrid plants as impure ‘bastards’. Interestingly, in this exchange, the argument for hybrids is given equal, if not more weighting than the argument against. It will be interesting to see how the debate about human-animal hybrids and chimeras unfolds in the future against the deep historical background of art, mythology, literature and science that I have tried to outline in this post – and I have only scratched the surface.